VANCOUVER — Nikita Kucherov scored and added an assist to earn his 50th point of the season to lead the Tampa Bay Lightning to a 5-2 win over the Vancouver Canucks on Tuesday. A feisty Canucks squad kept pace with the Lightning in a heated game marked with a flurry of fights, but they couldn’t over power the NHL’s No. 1 team. Tampa Bay has not lost in regulation since Nov. 27. Cedric Paquette, Adam Erne, Steven Stamkos and Ondrej Palat also scored for the Lightning (26-7-2). Tyler Motte and Chris Tanev put up goals for the Canucks (16-17-4). 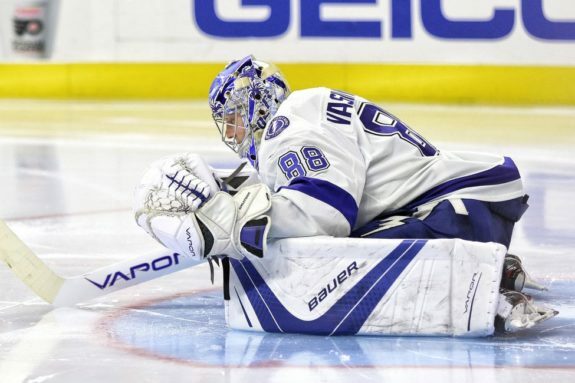 Anders Nilsson stopped 34-of-38 shots for Vancouver and Andrei Vasilevskiy made 36 saves for Tampa. Kucherov opened the scoring 8:40 into the game, getting the puck off the faceoff and firing a shot past Nilsson. Frustrated Canucks defenceman Erik Gudbranson broke his stick on the net as Tampa Bay celebrated. Lightning centre Brayden Point registered an assist on the play, marking his 150th point in the NHL. The Canucks responded to Kucherov’s goal less than a minute later. Defenceman Troy Stecher found Motte in front of the net and Motte tipped the puck in past Vasilevskiy to tie up the score. The Lightning went up again before the end of the first period, thanks to a move by Danick Martel, who was playing just his second game of the season. While spinning away from Vancouver’s Ben Hutton, the left-winger got a seemingly blind pass off to Paquette who was alone in front of the net. Paquette got the puck on his tape and popped it up over Nilsson’s pad. The assist was Martel’s first NHL point. Midway through the second frame, the Lightning struck again when Canucks right-winger Brock Boeser struggled to clear the puck. Paquette found the rubber in front of Vancouver’s net and Erne deflected it in to put the Lightning up 3-1. Fists flew throughout the second period, starting with a tilt between Vancouver’s Antoine Roussel and Tampa’s Yanni Gourde. The Canucks left-winger hit the Lightning centre along the boards, sparking a fight that saw Roussel pummel Gourde on the ice before officials could intervene. Vancouver defenceman Troy Stecher left the ice and headed to the dressing room after a high hit from Martel, prompting another skirmish. By the end of the period, refs had doled out a game misconduct, two fighting majors and three roughing penalties to Tampa Bay. Two Vancouver players were clocked for fighting and four for roughing. Despite all the time spent in the box, neither team registered a power-play goal Tuesday. Vancouver got back within one 5:46 into the third period when Tanev snuck a wrist shot past Vasilevskiy during a burst of activity in front of Tampa Bay’s net. 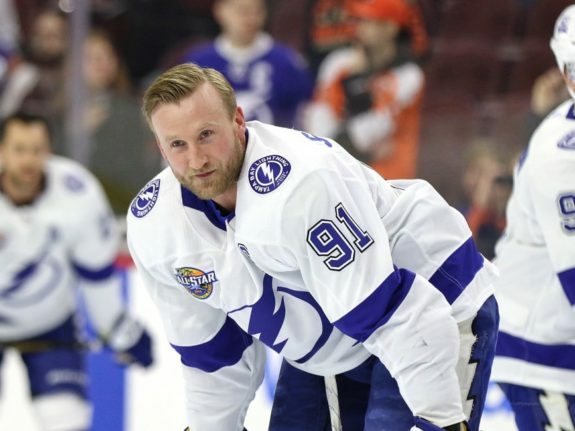 Stamkos gave his team some insurance over two minutes to go in the game, slipping a wrist shot past Nilsson. Palat sealed the game with an empty-netter less than a minute later. Kucherov got the helper, marking his 50th point of the season. The Canucks continue their five-game homestand Thursday when they host the St. Louis Blues. The Lightning head to Calgary where they’ll take on the Flames on Thursday.